(Palo Alto, Calif.)—Peninsula Open Space Trust (POST) and the McCrary Family, owners of Big Creek Lumber, today announced their agreement to permanently conserve 937 acres of redwood forest in the Santa Cruz Mountains. This two-property, multi-party deal establishes a working forest conservation easement – the first to be implemented collaboratively with a timber company in the Santa Cruz Mountains – on 617 acres of second-growth redwood forest. It also permanently protects 320 acres of critical watershed, mature redwoods and wildlife habitat adjacent to Butano State Park. Here we have highlighted the two properties we protected in collaboration with Big Creek Lumber, totaling 937 acres of redwood forest. Click here for an enlarged version of this map. This arrangement involves two separate but interdependent land deals. POST and the McCrary family have agreed to conserve both properties, totaling 937 acres, for a project valued at $11.7M. Through this deal, Big Creek secures access to a reliable, sustainable, and ecologically appropriate supply of timber for its nearby sawmill in Davenport, and POST protects almost 1,000 acres of iconic redwood forest. POST is acquiring a 617-acre property known as Valencia Creek from Cal Poly Corporation and is permanently protecting it from development. 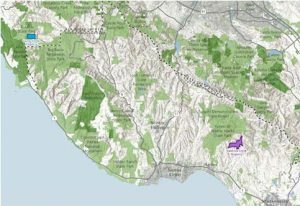 The property sits within the upper watershed of Aptos Creek in Corralitos. Recognizing a unique conservation opportunity, the McCrary family is selling POST 320 acres of mature, unharvested second-growth redwoods in the Gazos Creek watershed as part of the transaction. This unique partnership between POST and the McCrary family will result in Big Creek owning and managing the Valencia Creek property, with POST holding the working forest conservation easement. The Gazos Creek parcel has not been harvested by the McCrary family, who have cared for the property for over 50 years. It falls within one of only seven critical habitat areas in the region for the endangered marbled murrelet and is home to many other species. They are selling this parcel to POST at a very favorable price in exchange for the conserved Valencia Creek property. Sempervirens Fund, the Bay Area land trust dedicated to conserving redwood forests in the Santa Cruz Mountains, is contributing to the acquisition by assuming management of the Gazos Creek parcel from POST and caring for it until it can be transferred and incorporated into Butano State Park. Sempervirens Fund has worked to expand and connect state park lands, including Butano, Big Basin, Portola Redwoods and Castle Rock State Parks. The deal is made possible through a variety of funding sources including the California State Coastal Conservancy, the Gordon and Betty Moore Foundation, POST and the McCrary family, with additional support from Sempervirens Fund. 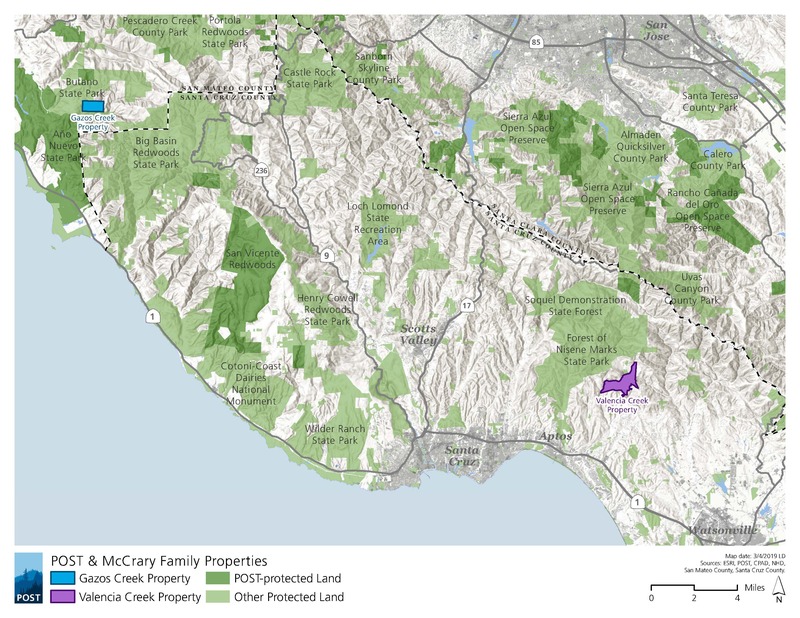 POST protects open space on the Peninsula and in the South Bay for the benefit of all. As a private nonprofit land trust, POST has been responsible for saving more than 77,000 acres over the last 42 years. POST works with private landowners and public agencies to connect people and nature for the benefit of all. Visit openspacetrust.org for more information. The McCrary family settled on a small farm near Big Creek in Santa Cruz County in the 1860’s. The family started a sawmill, Big Creek Lumber, in 1946. The family-owned company now operates five retail lumber yards, a sawmill, wholesale division, forestry department, and logging operation. They also own timberland and manage timber for private landowners throughout the Santa Cruz Mountains. Big Creek Lumber has a long history of superior forest stewardship and utilizes a framework of progressive and conservative forest management practices, like selective harvesting, to manage redwood forests that will remain productive and environmentally viable for future generations. Big Creek Lumber is the first wood-products company operating within a redwood forest to have been awarded the “Well Managed Forest” Certification by the Forest Stewardship Council (FSC)®. Visit bigcreeklumber.com for more information. Sempervirens Fund’s mission is to protect and permanently preserve redwood (Sequoia sempervirens) forests, wildlife habitat, watersheds, and other important natural and scenic features of California’s Santa Cruz Mountains, and to encourage public appreciation and enjoyment of this environment. They protect, connect and care for the local redwood forests between Silicon Valley and the Pacific Ocean – while opening up more ways for people to enjoy them. Since 1900, Sempervirens Fund has permanently protected more than 53 square miles of local redwood forests and watersheds for people, wildlife and future generations. Visit sempervirens.org for more information. The State Coastal Conservancy is a State agency, established in 1976, that protects and improves natural lands and waterways, helps people get to and enjoy the outdoors, and sustains local economies along the length of California’s coast and around San Francisco Bay. The State Coastal Conservancy is one of ten State conservancies within the California Natural Resources Agency. Visit scc.ca.gov for more information.